Who doesn't love samples? It's one of the things I really love about shopping Sephora online. I think we all like to splurge on makeup and facial care when we can, but what to buy? 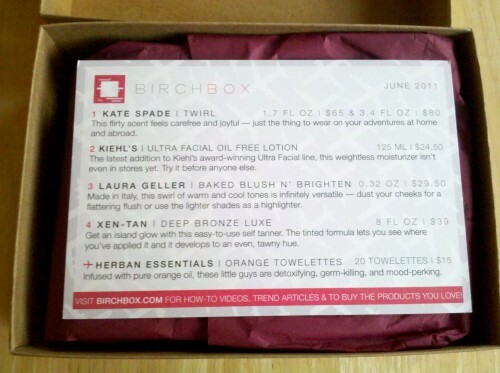 Enter BIRCHBOX. 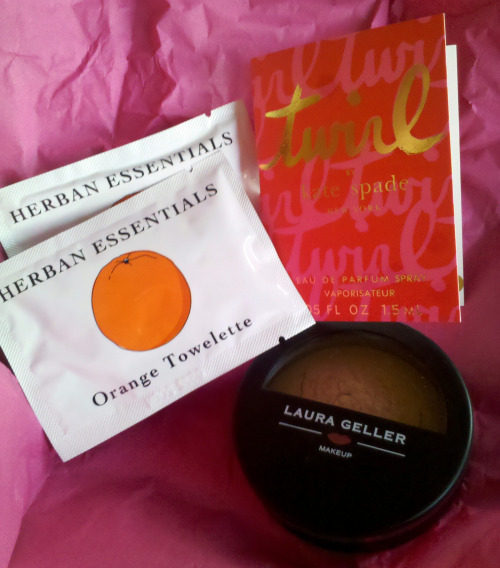 For $10 a month, you receive a beautifully packaged gift box full of 4-5 deluxe beauty samples sent to your door. This bronzer- incredible! Loooove it. And it's a full-size product! I'm a fan of Kiehl's- this lotion is great. Self tanner's scare me a bit, but I'll give it a go. All in all, amazing deal for $10, right?? With a subscription you also get access to their website, which is chock-full of beauty tips and tutorials. You earn points with your subscription, which can be used as discounts when purchasing full-sized products from their site. Couldn't be happier that I signed up, and I can't wait to see July's little pink package in the mail!